You probably thought I was done with the venison recipes, didn’t you? Not just yet, my friends. With J’s last deer of the season we had them make us some venison fajita meat because…why not?? And it’s a good thing we did. This was some of the most tender, delicious fajita meat I have ever eaten. And I love fajitas. A lot. We were almost going to have them at our wedding, but opted for barbecue instead. Now, like most things venison, lately, I made these just as I would beef fajitas. I used the same accompaniments and toppings that I normally would. And they turned out fantastic. With any thin cut of meat, you have to watch it carefully to make sure you don’t overcook it and make it dry and tough…so I was watching like a maniac and so worried that I’d somehow ruin them. One more thing I wanted to make sure you all know…I didn’t taste any gaminess in these fajitas. Like, not even a hint. So, if you have a venison-hater in your life, this might be the gateway meal to get them to start trying more dishes! Just a thought. 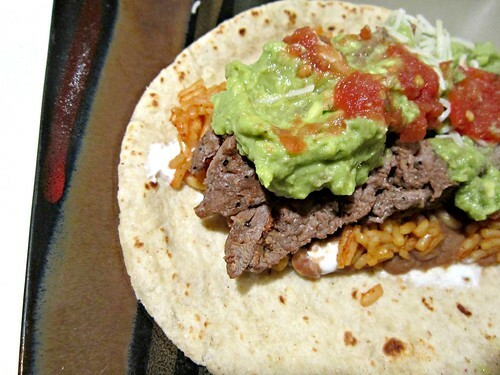 If you have pre-seasoned venison fajita, please skip to #4. If you do not have pre-seasoned fajita meat prepared by a game meat processor, then take your venison loin(s) and beat with a meat tenderizer until flattened to about 1/2-inch thick. You can cut into smaller sections for easier cooking, but don’t cut into strips just yet. Season the loins with the chili powder, cumin, onion and garlic powders, paprika, salt and pepper. Prepare the Spanish rice by following the directions on your chosen package. Slice your onion and bell pepper into strips. Heat a skillet over medium heat, add 1 tablespoon of olive oil, and cook the strips slowly until slightly browned and softened, about 10 minutes. Prepare your refried beans by placing the contents of the can into a medium pot, adding cumin and garlic powder and heating over low heat, stirring occasionally, and keeping warm until ready to use. Meanwhile, preheat a skillet or grill pan over medium high heat. Spray with cooking spray. Add the fajita meat to the hot skillet, in batches if necessary, and reduce heat to medium. Cook for 2-3 minutes and then flip, and cook an additional 2-3 minutes, or until almost completely cooked through. A little bit of pink is good, as it will continue to cook on it’s own once you remove it. Remove to a cutting board and allow to rest for about 5 minutes before slicing, against the grain, into 1/2-inch strips. While the fajitas are cooking, prepare you guacamole. Scoop the flesh of two avocados into a medium bowl and use the back of a fork or a potato masher to smash until mostly smooth. Add the lime juice, garlic powder, and salt and pepper, to taste, and mix. Taste and adjust seasonings as needed. To assemble, warm tortillas and top with refried beans, rice, Greek yogurt, fajita slices, guacamole, onion and bell pepper slices, salsa, and shredded cheese. Or if that’s too much on the fajita, you can serve the rice and beans on the side, of course. I like mine all mushed together.